What's the difference between a plum and a prune? Today, prunes are used to describe dried plums. Plums are known as prunes in France. Due to the perception of prunes being used for constipation in older people, many distributors today have stopped using the word on their packaging. The preference now is to state "dried plums". The Sowden Bros. prefer to use the traditional term prunes to describe their organic dried plums. They are a rich source of fiber and contain important nutrients including Potassium, vitamin C and K, and are rich in minerals including iron. They also include a compound that has high antioxidant activity. The antioxidant content of fresh plums doubles when they become prunes. The prune graft is known today as the California French Prune and comprises approximately 99% of the state’s production, of which most lies within the Sacramento Valley. 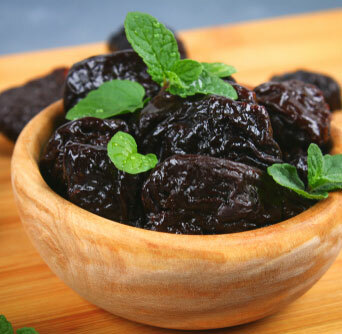 What are some of the dietary benefits of prunes? Are you the grower as well as the shipper? Yes. All of our prune products are grown on our farm, packaged and shipped to you. From bloom to box, the Sowden Bros. are a 100% dedicated organic operation. Certified organic growers since 1981, Buzz and Bud Sowden are first generation farmers with nearly 350 acres of organic prunes located in Sutter County in the shadow of the Sutter Buttes in the soil-rich Sacramento Valley. Yes. All of the prunes we grow, buy, and process are certified organic by QAI . U.S. producers are turning to certified organic farming systems as a potential way to lower input costs, decrease reliance on nonrenewable resources, capture high-value markets and premium prices, and boost farm income. Organic farming systems rely on ecologically based practices such as cultural and biological pest management, exclusion of all synthetic chemicals, antibiotics, and hormones in crop and livestock production. For more information visit the United States Department of Agriculture (USDA) website. All shipments originate from our farm in Live Oak, California. Domestic (US 50 states) and international shipping available via US Postal Service priority mail. We're currently shipping internationally to the following countries: Australia, Korea, Japan, Malaysia, Europe, China, and Taiwan. If you live in a country not listed and are interested in ordering, please contact us and we can discuss shipping options. What forms of payment do you accept on this website? We accept VISA, MasterCard, Discover, American Express via PayPal.